I am a huge fan of hummus, and I love to create different variations that I can snack on whenever I feel the need, and I find a spoonful of hummus on a celery stick or whole grain cracker really satisfies those between meal hunger cravings. My husband on the other hand, is a guacamole addict. He will spoon or spread guacamole on just about anything you can imagine, and during our six months in Florida, we always have avocados in the house. 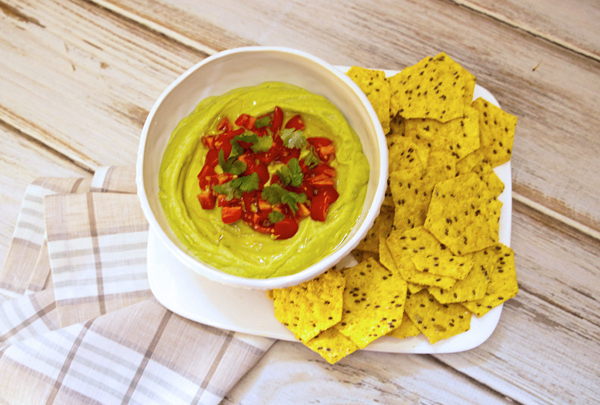 Recently I combined our two favorite snack foods into one creamy dip, and we both loved it. 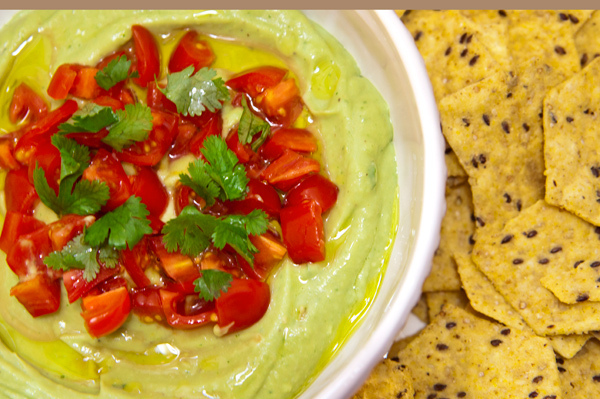 It has the protein of the hummus, and healthy fats of the guacamole, tastes great, and is truly satisfying. Avocados are famous for their healthy monounsaturated fats which are thought to lower levels of LDL (bad cholesterol) and raise levels of HDL (good cholesterol). They are also high in fiber and have even more potassium than bananas. Choose avocados that feel heavy, are blemish free, and that yield to gentle pressure. Store unripe avocados at room temperature and if you need to rush the ripening process, place the avocados in a brown paper bag with a banana. The banana will release ethylene which will speed up the ripening of the avocado. Since avocados discolor quickly, cut them just before needed. You can toss chopped avocado with a little lemon or lime juice to prevent discoloration as well. Peel and coarsely chop the avocados. Place the avocados, chickpeas, olive oil, lemon juice, salt, pepper, and cilantro leaves in a blender or food processor and blend until creamy smooth. You may want to add a little water, lemon juice, or olive oil if the mixture is too thick. Combine the topping ingredients and spoon on top of the hummus. 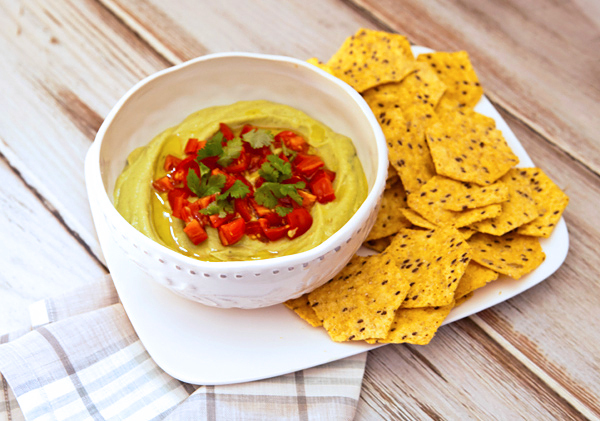 Serve the hummus with whole grain tortilla chips, celery and carrot sticks, or pita chips.